Bangkok Screening Room will be showing Stanley Kubrick's The Killing next month. 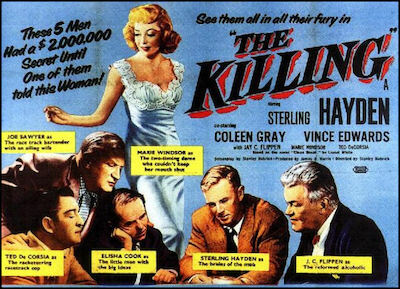 The Killing, a noir thriller, was the first film Kubrick made with his producing partner James B. Harris. (His previous films, Fear and Desire and Killer's Kiss, had been made without a production company.) The Killing was one of many crime films influenced by John Huston's The Asphalt Jungle, though its editing is entirely original: its non-linear narrative style would later influence Quentin Tarantino's Reservoir Dogs. Sterling Hayden, star of The Asphalt Jungle and The Killing, would later play Jack D. Ripper in Kubrick's Dr Strangelove. The Killing will be shown at Bangkok Screening Room on 15th, 16th, 20th, 22nd, 23rd, 24th, 29th, and 30th June; and 1st July.